NASCasino excites the iGaming market with a sophisticated gambling platform to offer over 250 games and several lucrative Bitcoin casino bonuses. NASCasino packs surprising features guaranteed to captivate the interests of all kinds of gamblers, even at first glance. 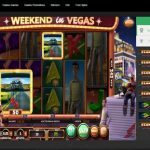 Recently fresh from a revamp as of writing this review, this Bitcoin casino has the makings of a leading brand in the industry. With tried-and-tested software technology on board, NASCasino is a name to remember. 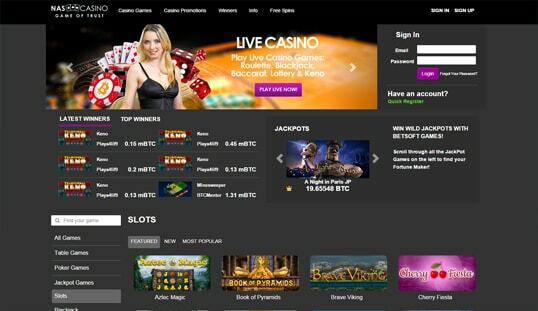 It was redesigned as a full-fledged Bitcoin casino by 2015, and it is operated by SoftSwiss. It is also regulated by the government of Curacao. The highlight of NASCasino is its vast collection of Bitcoin casino games. With over hundreds of games in its game library, it certainly lives up to its distinction as one of the prime examples of a successful Bitcoin casino. Given the number of titles available, it is impossible for NASCasino to miss out on the preferences of Bitcoin casino players. After all, this website offers games that include Bitcoin slots, blackjack, roulette, table games, poker games, keno, lottery, and even jackpot games and live dealer casino. Considering this impressive lineup, it is vividly clear why NASCasino maintains its renowned status today. To top it all off, gamblers ultimately prefer this platform because of its provably fair feature—the feature that maintains the credibility and fairness of every game result. 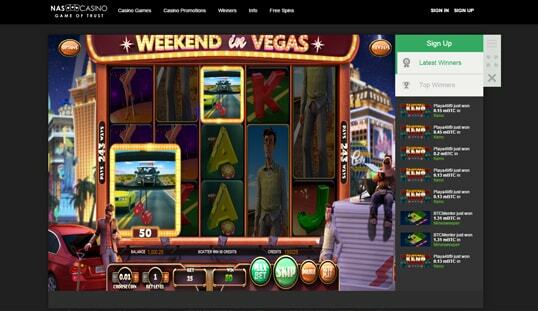 NASCasino is known to provide games that are of high-caliber quality. Compared to its competitors, this Bitcoin gambling platform is powered by some of the most trusted and impressive game and software developers in the iGaming industry. SoftSwiss is the primary Bitcoin casino software platform powering this casino while game content providers like Betsoft and Ezugi are responsible for the variety of games. SoftSwiss’ own games are also in the library, creating variety in terms of gameplay, graphics, and payouts. There is no need to download any software to play its games. You are bound to experience a stress-free process in this casino. Given that this platform is solely dedicated to the benefit of Bitcoin gamblers, its registration process is simple and straightforward. To create an account, all you have to do is provide your email address, password, and account name handle. Bitcoin is the only currency accepted here so far. All Bitcoin deposits are processed and credited immediately while cashouts are required six confirmations for the last deposit. There are no fees required for deposits and withdrawals. 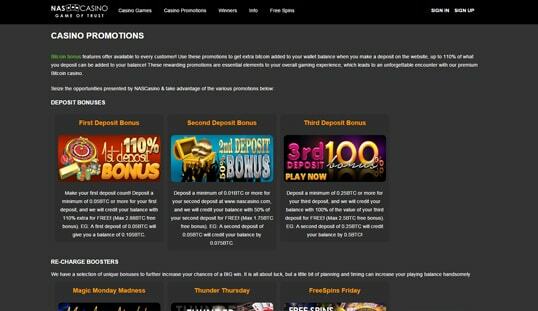 Another thing that makes NASCasino a platform worth the attention is its lucrative set of Bitcoin casino promotions. For starters, every newly registered player is bound to receive three sets of welcome bonuses. For your first deposit, you are certain to receive an overwhelming deposit match worth 110%. On your second deposit, a 50% bonus is credited to your bankroll. Finally, NASCasino shows its steadfast generosity by giving out a 100% bonus on your third initiated deposit as a new player. Other than deposit bonuses, NASCasino gives out weekly bonuses like the Magic Monday Madness where an additional 25% bonus credit is given, the Thunder Thursday where 20% additional is given to you, and the crowd-favorite Free Spins Friday. NASCasino is also mobile optimized. There is no need to download any third-party application to access this platform. All you have to do is enter the NASCasino web address on your phone browser to start gambling. NASCasino has a complete set of customer support options you can choose from. You can contact their support through email, phone, and live chat. You can also use the contact form on its site.